Who Keeps Moving My Chair? I bet it was a polterghoost. Yesterday was a day where nothing went according to plan. And that was okay. I worked on the Magnum Opus a lot. A lot. I kept getting broken pieces. A few were a foot long. Some a few feet. Then, I got one that was about 30 yards long. I rolled that one into a ball. I hope that put your life in perspective. 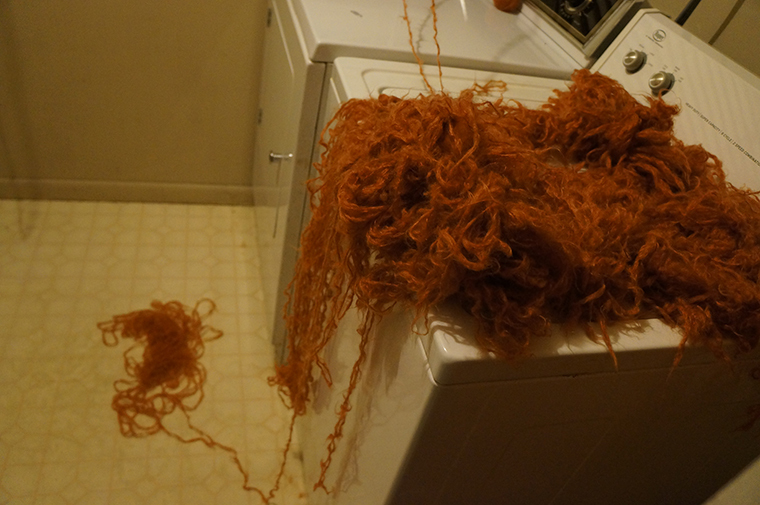 I’ve got about a skein and a half rolled into balls and another 40 or so yards on the floor. I had to force myself to stop last night and go to bed. I also did the second printing on everyone’s Grismas presnents yesterday. I didn’t photograph them, because I want there to be some level of surprise to the thing. Speaking of printing, today is the holiday open house at Underground Ink. It’ll go from 11-1. You should go. I’ll be there. « Worship At the Altar of My Productivity.